How Does a Waste Incinerator Work? The United States produces more than 250 million tons of solid waste every year. To deal with your trash, waste management companies use landfills and incinerators to dispose of what you toss out. Each of these methods has dangerous side effects. Alternatives to traditional “bury or burn” waste management strategies can assist in cleaning up our air, soil and water. 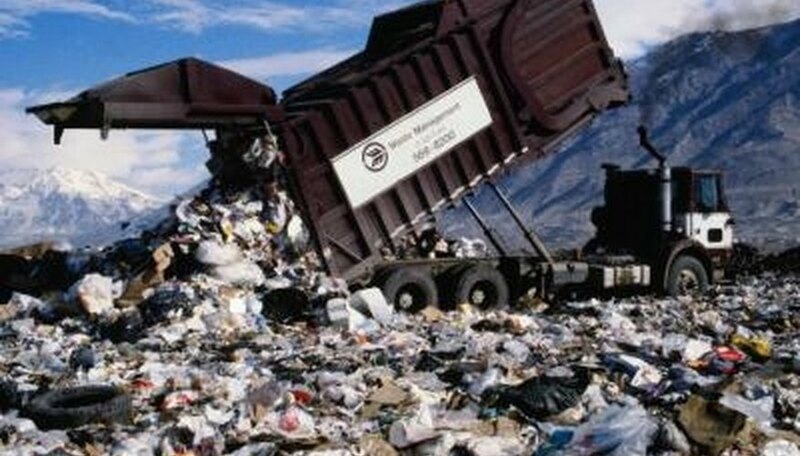 A landfill is a solid waste disposal method in which discarded materials are buried between layers of earth in an attempt to reduce public health hazards caused by decaying refuse. According to the Environmental Protection Agency (EPA), there are more than 10,000 old municipal landfills and more than 1,754 active landfills in the United States as of 2007. Though modern landfills are required to be impermeable waste containers, most of the older landfills were simply holes dug in the ground where everything from cans of paint to old washing machines was buried. However, even the newest landfill containers have been found to leak over time. The use of landfills has contributed to both air and water pollution. Many landfills, especially older landfills in rural areas, are prone to producing leachate. Leachate is an often toxic liquid that results from rain passing through a landfill and seeping into the ground water. As rainwater passes through the landfill, it picks up organic and inorganic materials that contain elements harmful to humans. For example, heavy metals, pesticides and solvents combine with the water that eventually makes its way into 40 percent of municipal drinking water and 90 percent of rural drinking water. Dangerous gases emitted from the decaying contents of landfills increase air pollution. Studies on how close you live to a landfill show a marked likelihood of developing certain illnesses, including diabetes. Some solid waste, especially health-care waste, is destroyed using incinerators, which burn discarded materials into ash. According to the EPA, Pennsylvania, Maine and Minnesota are the top three states that use combustion to destroy solid waste, with Alaska, Oregon, Virginia, New York and Florida following closely behind. But even if there is little or no waste incinerated in your state, this does not mean that potentially toxic incinerated material is not present in your area. Incinerator ash is exported to other states to be used as landfill cover, contributing to the landfill leachate that seeps into the water supply. Burning waste emits toxic gases and particulates (which can settle in your lungs) into the air. It is not confined to the area where it is incinerated, as air currents can distribute the toxins this burning produces around the world. Both air emissions and incinerator ash include heavy metals and chemicals, such as cadmium, mercury, sulfuric acid and hydrogen chloride, as well as the deadly poison dioxin. Every man, woman and child in the United States throws away 4.5 pounds of trash every day. By practicing the principles of “reduce, reuse and recycle,” you can be instrumental in helping to solve our waste management problems. The EPA projects that our landfills and incinerators can only handle the solid waste our growing population produces for another 20 years. If you choose products with minimal or biodegradable packaging, purchase products with long lives, reuse an existing item in a different way and recycle your discards properly, the waste management system will be less impacted. Contact your legislator to promote recycling in your area and to make him aware of the increasing dangers of discarded electronics. Computers, printers and televisions contain toxic materials and need to be disposed of carefully. Gutierrez, D.M.. "Landfills Vs. Incinerators." Sciencing, https://sciencing.com/landfills-vs-incinerators-5523826.html. 24 April 2017.